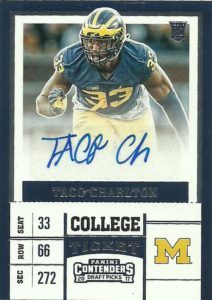 Taco Charlton appeared to me via a box breaker redemption. I can not emphasize how much I hate redemptions. It just says to me that the manufacturer of the product had a deadline to meet and failed to get the autograph from said player before time was up. Still Panini did make this pretty painless for me, and the redemption was covered pretty quickly. I have been very impressed with the 2017 set otherwise. It has some good subsets and the design is pretty solid. I can not say the same for Taco’s autograph- which is a wholly uninspired “TACO Ch….” The back of his card is pretty funny actually. It makes a ton of food and hunger related references, but surprisingly doesn’t talk about Mexican food or taco condiments at all. Taco is not Charlton’s given name, but he sure does like them. Taco played for the Michigan Wolverines from 2013 to 2016. He really began to light it up in his Junior year. The defensive end had 30 total tackles, 8.5 TFL, 1 FF, and 5.5 sacks. After that he took his game to an entirely different level in 2016, posting 40 total tackles, 13.5 TFL, and 10 sacks. With the physical attributes (6’6″, 277) and unique moves, he’s got the talent to play in the NFL. It seemed predestined for Taco to land in Dallas as their first round choice in 2017, where he has already landed a deal promoting the Mexican fast food chain Taco Bueno and later with Big Red soda. Charlton played sparingly his rookie year. He finished with 19 combined tackles, 3 sacks, a pass defended, and 1 forced fumble.